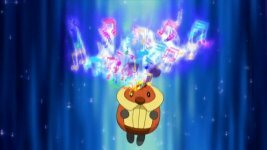 Nando has obtained five ribbons in Sinnoh and gained entry to the Grand Festival. In addition to that, he has also obtained a number of Gym Badges. He eventually came in the Top 4 of the Sinnoh Grand Festival but lost to Ash in the first round of the Sinnoh League. Evolved from Roselia prior to episode: Coming Full Festival Circle! Obtained prior to episode: Last Call, First Round! 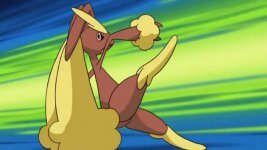 Nando used Lopunny during his Grand Festival Semi-Final match against Zoey. It used many powerful attacks such as Kick and Sing in order to dazzle its foes, but eventually it lost by a small margin. Obtained prior to episode: Coming Full Festival Circle! Armaldo is the last of Nando's Pokémon seen. Nando used it in his Sinnoh League battle against Ash. Sent against Ash's Quilava, it used its attacks such as Rock Blast and X-Scissor to try and defeat its enemy. It also has the defensive move of Protect to try and defend itself from Quilava's attacks. 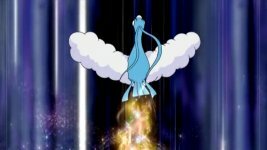 It eventually fell in battle to Quilava. Obtained prior to episode: Opening! Sinnoh League - Suzuran Tournament!! Evolved into Roserade prior to episode: Coming Full Festival Circle!